Blog posted by: Matthew Rycroft, 30 November 2018 – Categories: A Brilliant Civil Service, Civil Service Leaders. 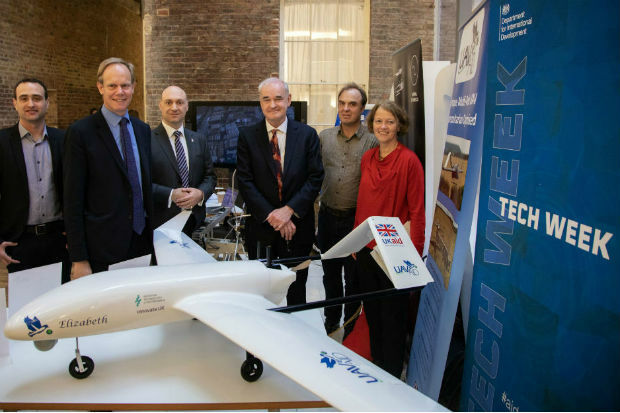 From left to right, Dr Gavin Smith, Matthew Rycroft CBE, Daniel Ronen, Dr Joseph Barnard, Alex Caccia, and Prof Charlotte Watts beside a prototype of an aid-delivering drone at DFID in Whitehall. Technology is changing the world, fast. We in the Civil Service can’t afford to ignore that. Instead we must harness it. Technology is revolutionising the way we deliver public services and deliver impact around the world. Technological innovations give us the power to connect, to include, to change and to improve. Pretending change isn’t happening is not an option – we must keep pace with it. The Civil Service of the future will need people with a broader set of skills so that we can navigate this complex environment more effectively as we serve modern Britain. In line with the vision of A Brilliant Civil Service – we must seek to embrace technological change, grasping the opportunities it presents. Learning more about harnessing technology for international development is my personal priority this year. The journey has been fascinating. I have a lot more still to learn, but some things I know already. We must be problem-led, and people-led. Our starting point should be the actual problems in the lives of the people we are focused on reaching, not the technology itself. We must avoid running after the next app or gadget. The technology is a vehicle, not an end in itself. Tech is not the answer to everything. It is crucial to get the right complementary systems in place: supporting the development of business models, identifying sources of finance, and enabling the right regulations and institutions that will shape how technology is used. This means development of capability across DFID, and indeed the Civil Service, not just in a narrow cadre of tech experts. We should think systematically through the technology aspects of all policy areas. In education, how can we harness the power of Artificial Intelligence to accelerate the learning of those currently most left behind? In healthcare and agriculture, how can we commission research in the way that best incentivises impact at scale. And, conversely, how can we understand better the potential challenges, such as jobs and industries threatened by new technology? And I hope we can think through how technology will transform how we work. There is more we can be doing to learn, rapidly, what works and what doesn’t. We will need to have a relentless focus on results and data. We also need an entrepreneurial spirit. For every success, we will have several failures. Rather than blame, we must welcome the learning from those failures. And then take the right initiatives to scale. This week, I met DFID teams to discuss how mobile technology is helping alleviate poverty and demonstrating that aid works, for instance through delivering services to farmers in the poorest countries of the world. I've recently heard how DFID and the UK Space Agency are joining forces to protect crops in Africa; and how UK aid funding has supported pilot projects to test the potential of Unmanned Aerial Vehicles (UAVs) in humanitarian response and development settings. The Civil Service has a global reputation for professionalism and expertise. But to remain at the cutting edge we need to continue to learn and change. A big part of that will be harnessing technological change to reduce poverty and promote UK interests around the world. I bet each of you can think how technology and innovation are transforming your area of expertise. Is there more you can do to get up the learning curve? Are there connections you can make, spreading examples that work in one area to other parts of your department or even across the whole Civil Service? In DFID, we seek to represent the best of modern Britain around the developing world. Please let me know if you have ideas on how we can do that even better.